$950 includes MS Access database system, portable barcode scanner, network site license and 500 pre-printed barcode labels! Download your Free Trial of Track’Em Today! Easy to use! Data collected with portable barcode scanner is automatically added to Track’Em database with one click of a button. 4 modules (Inventory Tracking, Asset Tracking, Check In / Check Out, Basic Barcode Label Printing) included for one low price. Dozens of reports ready to use. Customize reports using MS Access! User definable fields. Unlimited records can be added to database. Track’Em can be installed on a network without additional license fees. Multiple users can view the same data. Easily import / export data to Excel or text files. Set MIN / MAX field sizes on scanner in order to make sure you scan the correct barcodes. Accurately track inventory levels at multiple locations. Print barcode labels using your existing laser printer. Perform inventory audits and cycle counts with ease. Run re-order reports by selected vendors or all products. 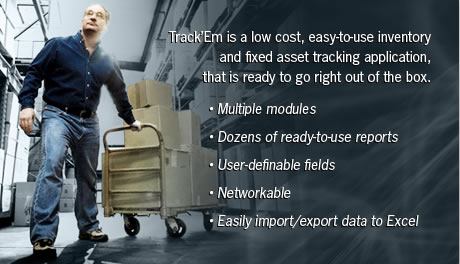 RVB Systems Group has developed a low-cost easy-to-use barcode solution for inventory and fixed asset tracking application named Track’Em. The STANDARD version ($950) comes with the portable and rugged Unitech HT630 PDT laser barcode scanner. The LITE version ($395) comes with the equally rugged Unitech MS210 USB corded CCD barcode scanner. Track’Em is ready to go right out of the box. It includes a password protected menu system, dozens of reports and data entry screens. Track’Em can be run on a stand-alone PC, or over a network on an unlimited number of workstations. 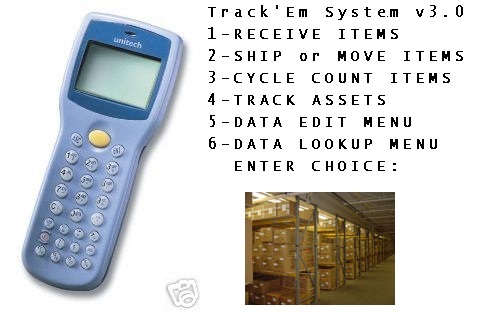 Track’Em Standard comes with a portable barcode scanner that is pre-programmed to easily collect information regarding assets (i.e., non-consumable items with different numbers, like the serial numbers on PC’s, documents, tools and equipment) and products / inventory (i.e., consumable items with the same number, like the barcode number on a case of copy paper). In addition to the 500 pre-printed barcode labels provided with Track’Em, both the Standard and Lite versions now allow you to print basic barcode labels on an 8 1/2 x 11 sheet using your laser or ink-jet printer. These labels contain a Code 39 barcode and the ASSET, PRODUCT or LOCATION description. If you need to print more advanced labels on a thermal barcode printer, select the Deluxe Label Printing Add-On consisting of either Bartender Professional or Bartender Automation. Track’Em was developed using Microsoft Access (MS Office 32 Bit Version), so you can easily customize any existing report or data entry form using your licensed copy of Microsoft Access (32 bit version). In case you do not own a copy of Microsoft Access, a free runtime version of Microsoft Access is provided along with Track’Em. All Track’Em packages are provided with free remote on-line and telephone support regarding installation, setup and basic operation for 30 days. On-line training classes as well as extended software support plans are available. If you need to make source code changes to the PC or scanner program, or if you want to create new reports, then you can also purchase the DEVELOPER ADD-ON package. RVB Systems Group is also available to help customize the Track’Em system. We also are available for on-site installation and training. The following chart provides a comparison of our two base packages, Track’Em Lite and Track’Em Standard. Click here to see the full list of products and additional features that we offer. Contact Us for the Track’Em PowerPoint Presentation. On-site installation, training and customization of Track’Em available. Call RVB Systems Group for more information on these options. Actual testimonials and comments from satisfied Track’Em customers. Additional references available upon request. “Just wanted to let you know I just got everything, and wanted to compliment you on your programming methodology…I have no problem following the code because its very straight line logical….very similar to the way that I was taught to program.” – satisfied DEVELOPER VERSION customer. “Thanks for a job very well done. You really went above and beyond.” – US Marine Corps (on-site training customer). “I have loaded the new program. It is working perfectly.” – satisfied CUSTOM VERSION of Track’Em customer. “Just a little note to tell you, I’m amazed at how easy this is. Thanks for everything!” – satisfied CUSTOM VERSION of Track’Em customer. “We have used this system now for about 18 months. We use it to track replacement parts usage on all of our assets. Once all of the data was entered, the systems started working for us. We now know what is used and what to reorder on a daily basis. My parts clerk starts his day every morning by running a custom report for daily usage and also an ‘order now report’. He immediately knows what needs to be reordered along with what he paid for it on the last order. This is helping us determine what we need to get right away or put off due to budget restrictions. In addition, we have now developed a history over the last 12 months which we are using to determine next year’s budget. I can say that we are very pleased with this product and would recommend it to anyone.” – satisfied Track’Em customer. This company purchased Track’Em for 5 different locations. “Just wanted to let you know that I really like your database. It was well planned out and easy to use. I figured out the VBA code I needed to modify, which is not my forte.” – satisfied DEVELOPER VERSION customer. In keeping with software industry standards, we do not provide refunds for Track’Em software. The evaluation version of Track’Em allows all prospective buyers to evaluate the product at their leisure to ensure that the software meets their needs before purchasing. We accept returns of Track’Em hardware within 30 days of purchase without our standard 20% restocking fee as long as the hardware is undamaged and is returned in the original unmarked packaging. Shipping charges are non-refundable. NO TRACK’EM HARDWARE RETURNS AFTER 30 DAYS.